Anyone who doubted that the wonderful summer of 2018 was at an end has had it confirmed during the first two weeks of the HYS Hamble Winter Series. Rain and plenty of wind from the North has had competitors digging out the layers and the waterproofs. 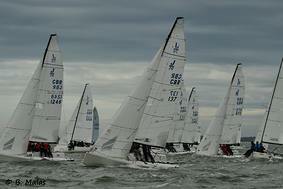 Saturday saw the start of the Hamble One Design Championships for J70 and SB20 fleets. The forecasts during the week promised average wind speeds of 20 kts with gusts in the region of 30 kts. In order to give the crews as much advanced notice as possible, RO Roger Wilson and the team met on Friday night to reach a decision. The outcome was that racing would go ahead, but with a delay of one hour to give crews time to launch their boats and make it to the East Knoll starting area. Racing got underway at the amended, appointed time with twenty-one J70s braving the conditions. All seemed well until a Cowes based yacht club decided to lay a windward gate inside the HODC windward gate causing some confusion at the top of the course. Race Abandoned! Negotiations with the Cowes based club as to where their buoys should be placed allowed Race 1 to go again. This time, despite two disqualifications under the U flag, all went well. The race team managed to get two more short races in and so at the end of Day one everything was back on track. In the J70s, Darcy, Clive Bush, was in first place with two seconds and third place, followed by Jelvis, Martin Dent and Eat, Sleep, J, Repeat, Paul Ward. Charles Whelan in Breaking Bod was leading the SB20s whilst showing the wrong sail number, with Reach Around, Christian Sutherland second and PB11, Paul Hine in third. 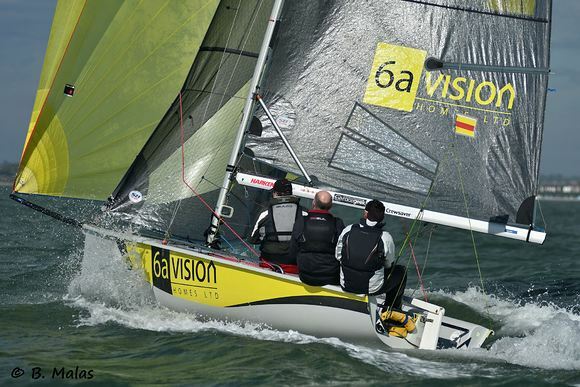 Sunday brought the IRC yachts to the Race Course for week two of the HYS Hamble Winter Series. As happens from time to time in the Solent, there was a distinct lack of water for Race Teams to run racing. The One Designs once again hogged the area around East Knoll which meant PRO Kathy Smalley had to disappear to Ryde Bank to give the main winter series boats a decent course in the northerly winds and rain. Fortunately, the committee vessel this week had both gas and sugar to keep Kathy and the team going in the appalling conditions. A couple of boats ran for home before the start, Mefisto, Sigma 38, Kevin Sussmilch, with a ripped main sail and Old Mother Gun, Philip Farrands with gear failure. As ardent TV viewers will know, Orange is the new Black, and so it became on the start line when Kathy Smalley, with a sugar rush, announced the pin to be Orange, when of course, everyone could see it was black. The colour was corrected and racing began. To everyone's delight Class 1 got away cleanly for both starts, there being no appetite for an AP in the conditions. Sailplane, Rob Bottomley and Davanti Tyres, Chaz Ivell and Paul Heys scored a first and second each in the two races, with Skermisher, Jonathan Blanshard next with a third and a fourth. Class 2 had a contested start in the first race with last year's series winner Malice, Mike Moxley, battling with Jago, Mike and Susie Yates, at the committee boat end whilst Hot Rats, Robbie and Lis Robinson were jousting with J Dream, Kirsty and David Apthorp a little further down the line. The order at the windward mark was pretty much how it finished with Malice just holding off Jago on the water, despite a fairly impressive round up under kite. Jago however had it on handicap with Hot Rats in third. In the second race some boats missed the wind shift so that those who stayed left made big gains, most notably Mojo Risin, Rob Cotterill, who took a satisfactory second behind Jago. Hot Rats, who spent Thursday in the slings with a heat gun on her keel, had another warm third place. Those serial heavy weather winners, Chris and Venessa Choules, in With Alacrity, scored two bullets in Class 3. Cetewayo, David Murry's Laurent Giles Classic had two second places and Quokka 9, Peter Rutter and Scarlet Jester, Jamie Muir, had a third and a fourth each. Pavlova 3, Max Walker, had some drying out to do having run over the kite. Although a number of competitors enjoyed the reaching that was on offer this week, it was not for everyone. Bertrand Malas was convinced it was no good for his petite Corby 25 M'Enfin?! Despite this he posted a second and a third. Meanwhile that old reaching machine Stan the Boat, Toby Gorman, had two firsts. There was a typical Impala tussle between Uproar, Andy Chapman and Two Frank, Oliver Love and Samantha Flint, with Two Frank coming from behind in both races to steal the place. The One Designs were also experiencing the big shifts associated with a northerly in the Solent. The second race had a 40 degree shift just as the Boats arrived at the windward mark which led to a straight line spinnaker reach down to leeward end. This was not tactically taxing but the serious grins on the crew's faces downwind said it all. 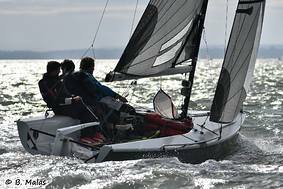 In the J70 fleet, which is also using the event as a World Qualifier, Darcy, Clive Bush, had three first on the day to finish top overall. Eat, Sleep, J, Repeat and J'Elvis were second and third. In the SB20s, Breaking Bod continued to dominate from Reach Around and PB11, but the biggest cheer of the day came from Andrew Bell's, Dark 'n' Stormy when they took the bullet on the last race. All the competitors were keen to congratulate the Race Team for operating in the foul conditions and special praise must go to the rib mark laying crews who kept going all weekend. 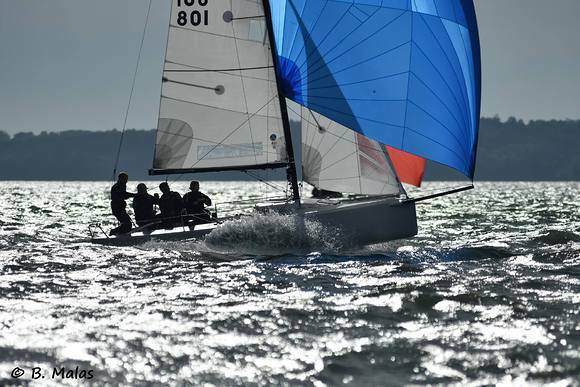 Next week sees the final weekend of the Hamble One Design Championship, the final Sunday of the Hamble Big Boat Championship and week three of the HYS Hamble Winter Series.